We know that parking for Sunday services can be a bit challenging due to the number of folks worshiping with us. The following will give you some guidance as to where to park. Parking Lot C is on the corner of Bigley Ave. & Mary St. Parking Lot D in under development on the corner of O’Dell Ave. and Mary St. There is also additional parking behind the gray building that is directly across from the main MCBC parking lot on Bigley Ave. 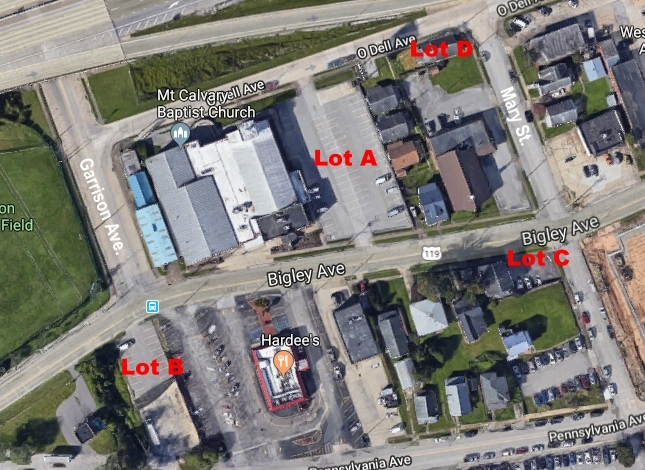 There are additional opportunities for on-street parking on Bigley Ave. Garrision Ave. and O’dell Ave.
Sunday mornings additional parking is available in the WV American Water Company lot on the corner of Mary St. and Pennsylvania Ave.